The South African squad that will face India in the first of their two warm-up ties on Saturday is packed with players who play in the IPL. In the list of teams most familiar with Indian conditions, South Africa rank quite high. Considering all factors, in the lead up to the World T20, their playing XI seemed well-balanced. However, on the eve of their arrival, Hashim Amla, snubbed in the last two IPL auctions has changed the narrative and is poised to make the playing XI. The 32-year-old, known more for his prowess in the longer form, smashed his highest T20 score against Australia in the just-concluded bilateral series between the two sides. 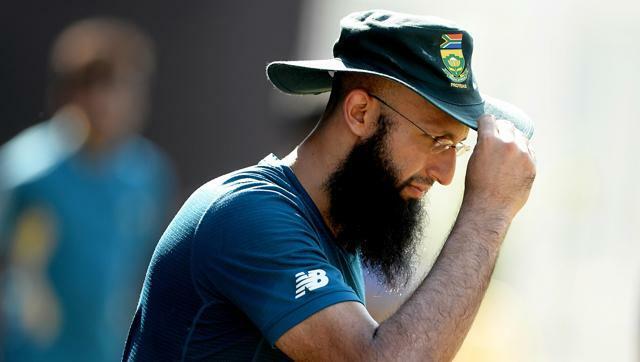 Amla got a chance to play in the third T20I against Australia in Newlands after regular opener AB de Villiers was rested owing to a shoulder strain. Amla scored an aggressive 62-ball 97 that also saw him partner Quinton de Kock to put on 47 runs in four overs. The uncharacteristic innings included eight boundaries and four sixes. While, the knock did not hand the Proteas a win, it did manage to push his case. “In World T20, form is important. You pick the players who are in form first. Hashim batted really well and is on top in the list to play in the XI,” skipper Faf du Plessis said. This has put pressure on middle-order batsmen JP Duminy, Farhaan Behardien and Rilee Rossouw. Amla’s stock as a T20 batsman has always been low. Initially, Amla has voiced his displeasure at playing in the IPL. However, in the last two seasons, the South African has tossed his hat in the player auction, but has been snubbed both times. Their warm-up game against India on Saturday will provide the side with a good opportunity to test out Amla. Like South Africa, India too are looking to solve a last minute conundrum with the playing XI. Pacer Mohammad Shami impressed on his return with two wickets against West Indies in Kolkata on Thursday. While his performance does warrant a change in India’s pace attack that consists of in-form Ashish Nehra, Jasprit Bumrah and Hardik Pandya, Shami will be hoping to force himself into the playing eleven with another bright performance on Saturday. South Africa(From):Faf du Plessis (c), Kyle Abbott, Hashim Amla, Farhaan Behardien, Quinton de Kock (wk), AB de Villiers, JP Duminy, Imran Tahir, David Miller, Chris Morris, Aaron Phangiso, Kagiso Rabada, Rilee Rossouw, Dale Steyn, David Wiese.